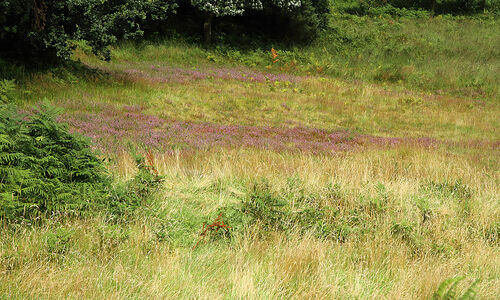 The heather at Crowborough Beacon is in decline. Heather is a relatively short lived evergreen shrub with a very interesting life cycle. 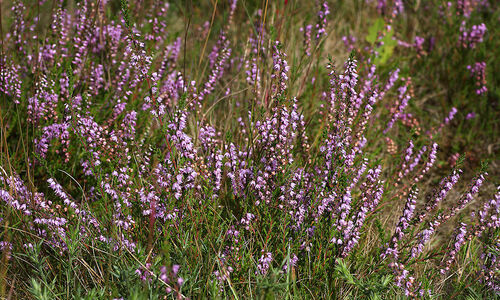 After germination heather enters what is known as the pioneer stage which lasts approximately 5 years. At this young stage the heather is prone to damage from trampling, therefore any area we regenerate must be protected from such trampling. 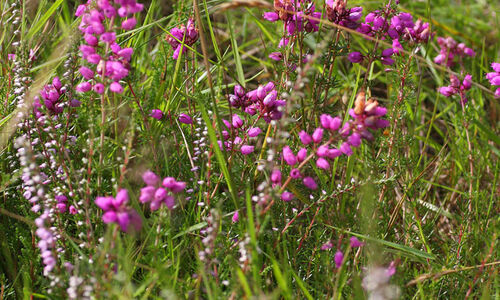 The second stage of heather growth is the most productive stage known as the building phase. This phase has a period of very active growth which can last for 15 years and it is during this time that the maximum growth, density and canopy spread are seen. During this time repeated, but infrequent cutting of the heather and the collection of debris is to be encouraged. Management carried out in such a manner will help to retain the plants building phase indefinitely. 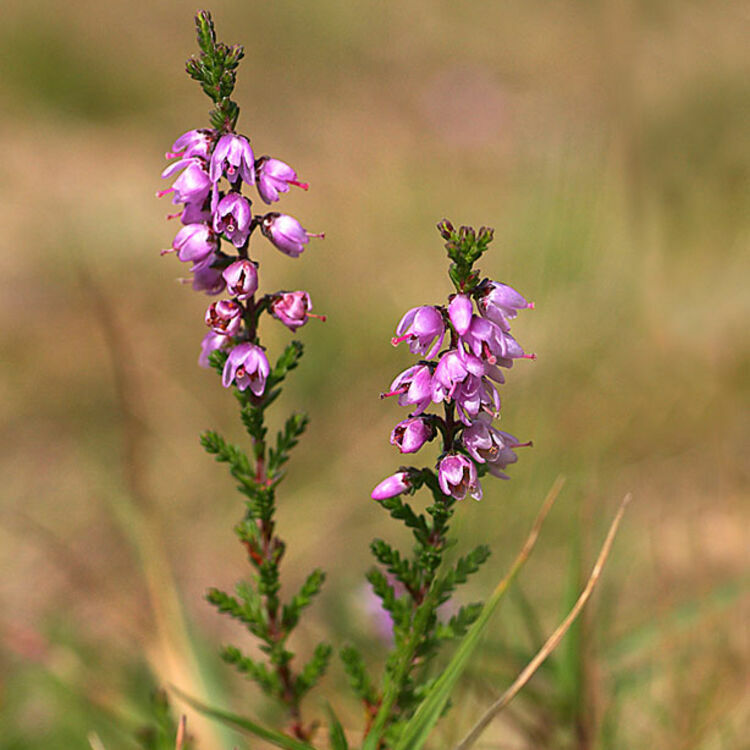 If neglected, heather will pass through the building phase and over 10 years or so it will pass through the mature phase and enter the degenerate phase. During these phases the plant tends to become very woody and loses its ability to recover from wear and tear. Regular cutting during these later phases of the plant’s life is very unlikely to encourage vegetative regeneration and more likely to hasten its ultimate demise. Ingress of both weeds and grass also becomes a problem as these weeds and grass, when mown, are responsible for enriching the soil which again is detrimental to the heather plants. 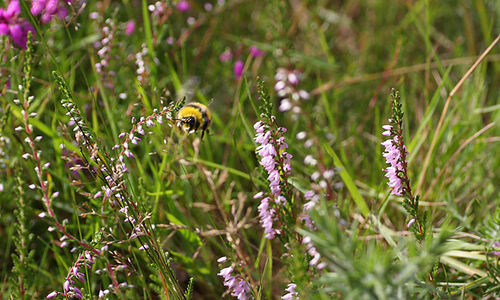 Over the past 12 years we have trialled various ways to improve and regenerate the heather. It is not an exact science and whilst not all attempts have been successful it is clear that without, if we do nothing, the heather will continue to decline and eventually disappear. 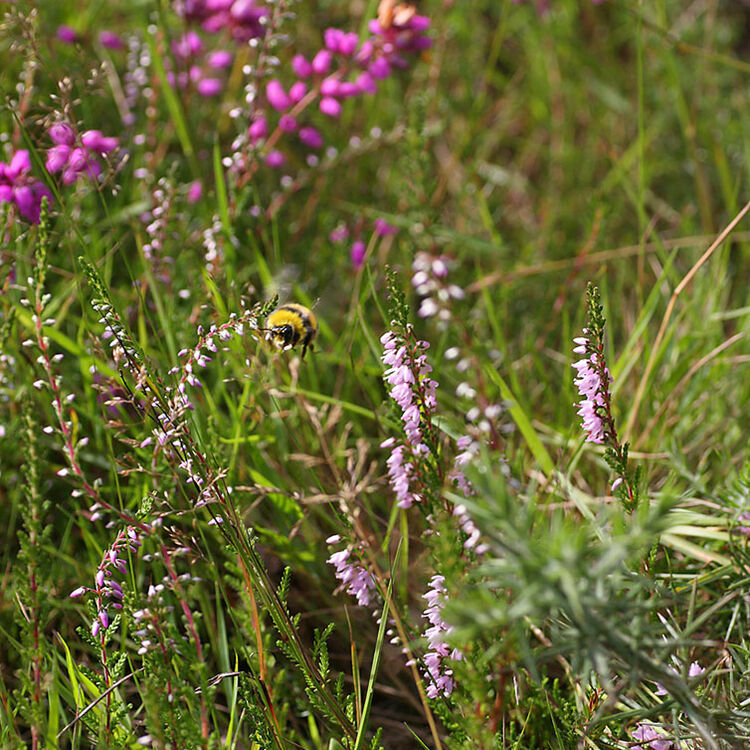 We need to instigate a regeneration programme and a complementary management programme so that we can create and maintain areas of heather, both on and off the golf course itself, to the standards of other high quality heathland courses. 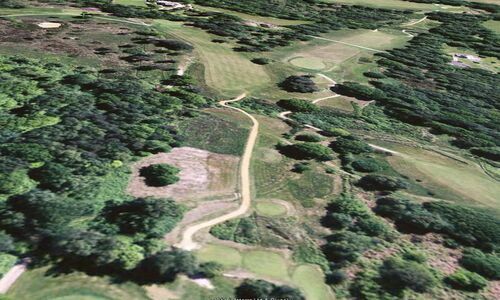 Done properly and in conjunction with other plans to make the course more user-friendly, we should enjoy faster rounds of golf and encourage fewer lost golf balls without losing the character of what should be a traditional heathland golf course. 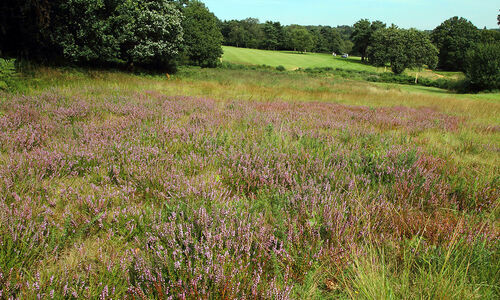 It is interesting to compare some of the attempts at heather restoration at Crowborough with the more widespread and routine renovation programmes underway at Piltdown, Royal Ashdown and Hankley Common, which are all featured at the foot of this page. Woodland clearance to the left of the 2nd and the 8th fairways at Crowborough has seen large scale replacement of scrubland by healthy young heather. A reluctance in the past, to undertake exactly the sort of restoration necessary, is clearly demonstrated by the pictures of mechanical clearance to the left-hand side of the 16thpathway down from the tees. The first section was scraped and cleared of all litter in February 2008 and now has a healthy re-growth of heather. The area further on remains untouched and is severely overgrown and is now almost devoid of heather. The solution is obvious; it must be cleared down to bare earth, followed by patience. 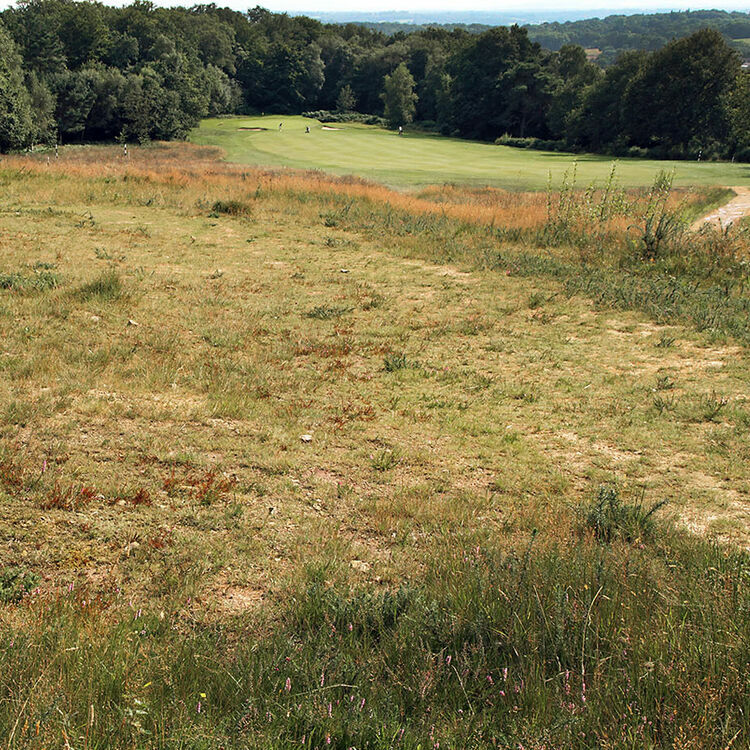 The area to the left-hand side of the 7th fairway, cleared in January 2012, shown in the picture below, now cleared of chest-high bracken, and within just 8 months, is already showing early signs of healthy heather regeneration. 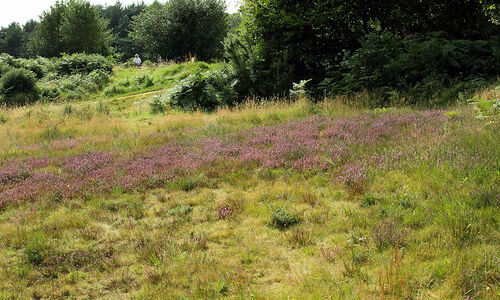 Even the bare earth in front of the 4th tee, which was cleared for reasons of visibility and not heather regeneration, in October 2008, some 4 years later shows heather regeneration. Quite amazing bearing in mind that the ground was reduced in height so severely that nothing could have been expected to re-grow in what amounts to almost solid sandstone. 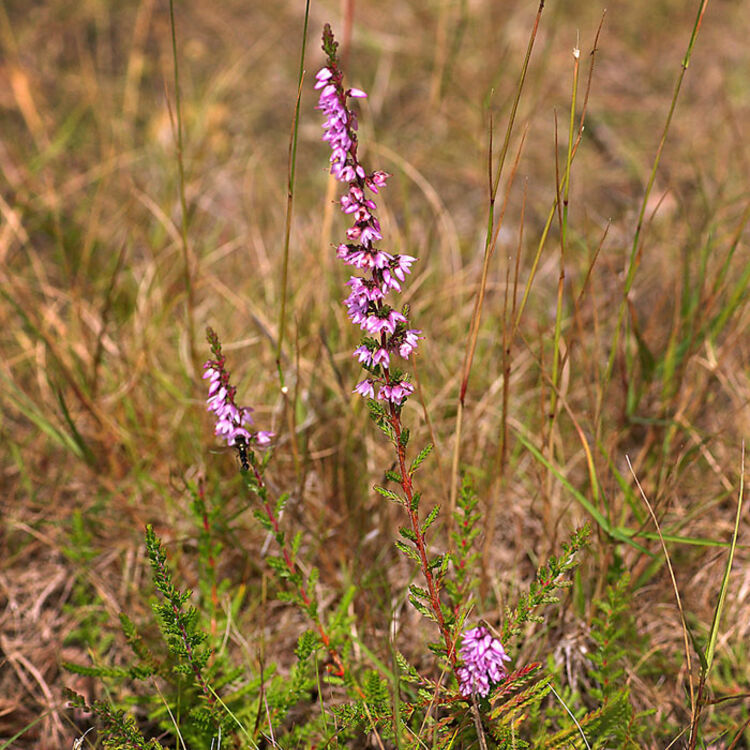 And yet young heather plants are now becoming established. 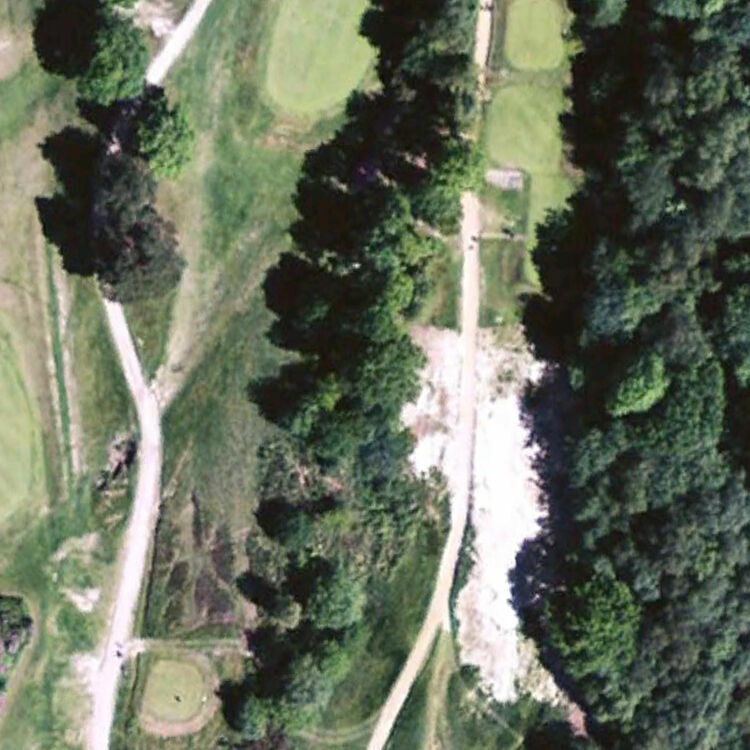 Same area viewd from above, between the tee and the fairway. Four years later, regeneration at last. But the rewards are worthwhile. 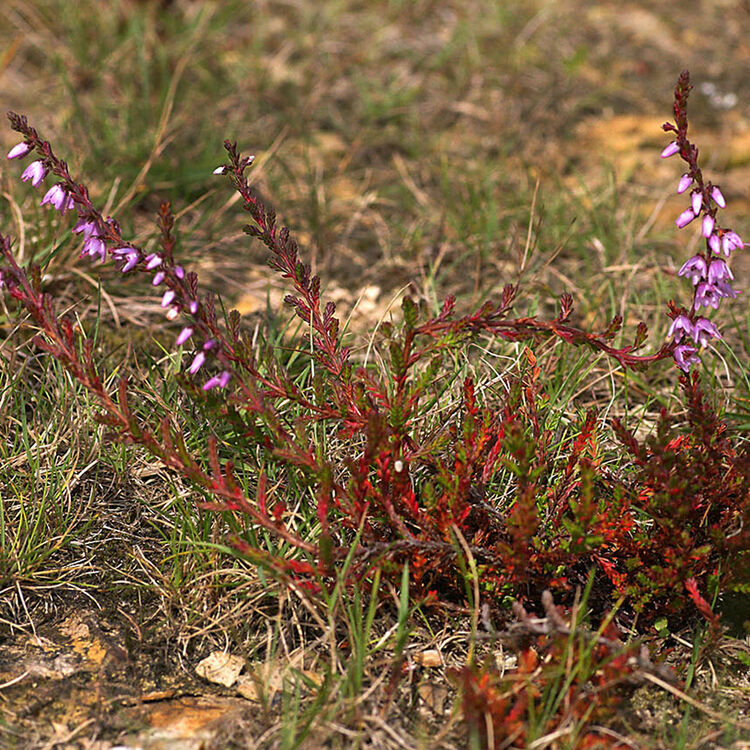 It is well known that heather seeds can lay dormant in the layer of litter under the surface but is unable to germinate once it is out-competed by grass, especially the tightly-knit Molinia which we have in abundance at Crowborough. As the cleared areas demonstrate, once sunlight can germinate the heather seeds, regeneration in areas known to have once supported heather in abundance is highly likely. These areas need to be treated as areas of G.U.R. for as long as 2-3 years and roped off to avoid traffic but once the heather becomes re-established, it will be possible for us to cut regularly and keep to manageable heights, not only for the ease of ball-finding but also for the long-term health of the new heather plants. Please follow this link to see how various other Golf Clubs are progressing with their heather regeneration. 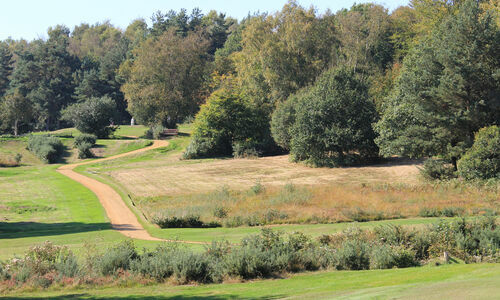 In January 2013, the Golf Club invested a significant sum of money in the Weidenmann Heather Management System. Please click here to read all about this brand new machine.